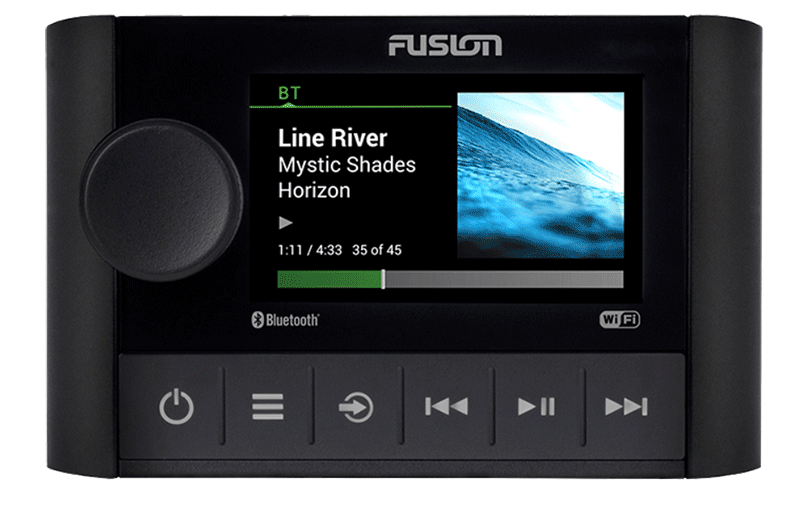 Ralph’s Radio in Vancouver and Victoria proudly announces that the new Fusion MS-SRX400 marine-grade digital media receiver is now available. The new Apollo series products from Fusion have redefined the benchmark for marine and powersport source units. This media player includes Bluetooth and Wi-Fi connectivity for audio streaming, an IPx7-rated water-resistant design and an easy-to-read 2.7-inch LCD screen in a compact package that will fit almost anywhere. Just like its big brother the MS-RA770, the SRX400 includes a built-in Wi-Fi hotspot that allows you to connect your smartphone or tablet for crystal-clear audio streaming. Wi-Fi streaming outperforms Bluetooth thanks to a dramatic improvement in available bandwidth. The Fusion MS-SRX400 also features an AM/FM receiver with adjustable frequency spacing that works with North American, Japanese and European radio frequency spacing. As fun as it looks, the Fusion PartyBus isn’t a 30-seat limousine. PartyBus is a networking solution that allows you to connect multiple Apollo-Series units to share the same signal source. Let’s say you have a cruiser with a large deck and an equally comfortable cabin. We can install an MS-RA770 at the helm to serve as the master source unit and then add an MS-SRX400 down in the galley to control music below. PartyBus allows the SRX400 to play the same music as the RA770 in Party Mode or operate independently in Personal Mode. The best part: Music from the RA770 isn’t interrupted when the SRX400 joins or leaves the party. If you have a large yacht, PartyBus supports up to eight devices so every space can have networked audio at the touch of a button. When paired with a smart device running the Fusion-Link app, you have access to configuring the built-in digital signal processor (DSP) to equalize your audio system for smooth, natural and life-like performance. The DSP also monitors the output level of the deck and uses a feed-forward limiter to eliminate clipping distortion caused by the source unit. Even with the volume cranked, your music will sound great! The compact SRX400 includes a two-channel amplifier that is rated at 35 watts each. The source unit includes a set of stereo RCA and a single mono subwoofer preamp output to drive external amplifiers. An RJ-45 Ethernet jack can be used to connect the unit with other Apollo-Series sources in a wired Party-Bus configuration. If you want the latest technology and best sound from your marine audio system, drop by either Ralph’s Radio location and speak with a member of our team. If you have any questions, give us a call or send an e-mail using our contact page.